I haven’t seen Manoj Night Shyamalan’s widely reviled Lady in the Water yet and I’m not all that keen to (though I think he’s an interesting director even when he’s making turkeys). But I’m annoyed by one aspect of the Indian media’s recent coverage of him: the complete overlooking of the Bruce Willis-Samuel L Jackson starrer Unbreakable, which I think is his most provocative work so far. Perhaps because this is a relatively understated film, it seems to have slipped beneath everyone’s radar – nearly every news or feature report I read informed us that Lady in the Water was his “fourth film”, after The Sixth Sense, Signs and The Village. Even a couple of TV journos whom I know to be well-informed film enthusiasts made this error of omission. Here’s the basic story of Unbreakable (and yes, spoilers do follow): David Dunne (Willis) is the sole survivor of a train accident that kills hundreds. Elijah Price (Jackson), the proprietor of a comic-book store/museum, contacts him and tries to convince him that he, David, has supernatural powers – that he needs to come to terms with his gifts and use them for the greater good. Elijah himself was born with a rare condition – unusually brittle bones – and he has been struggling with the repercussions all his life. He sees David as his antithesis, a man who is, quite literally, unbreakable. “I reasoned that if someone like me exists, there has to be someone else at the opposite end of the spectrum.” Initially sceptical, David starts to come around to this view, with some help from his super-enthusiastic (and super-annoying) 9-year-old son; what kid wouldn’t want to believe that his dad is a superhero? At the film’s end, just as David has started doing some halfway decent crime-fighting and we’ve been seduced into the superhero fantasy, comes the sting: it turns out that Elijah had engineered a number of accidents, killing hundreds of people in his obsessive quest for his opposite. “They called me Mr Glass!” he cries; it’s a line we’ve heard before in the film, in a quieter, more melancholy context (the neighborhood kids taunted young Elijah because of his multiple fractures) and hearing it now, we realise with a shock how appropriate the name “Mr Glass” is for a comic book supervillain – which is precisely what Elijah has become. Unbreakable isn’t an unqualified masterwork by any means. It suffers from the same flaws that have plagued every Shyamalan movie to varying degrees: the self-consciousness in his presentation of themes and Ideas (always a capital “I”); the sacrificing of his cinematic adeptness (and he has plenty of natural talent – his visual sense is close to that of Brian DePalma’s or Spielberg’s) to make way for ponderous exposition; the downright silliness of some of his set-ups. He’s also one of the very worst directors of actors I have ever seen (though Samuel L Jackson does quite well in this film, presumably by ignoring his instructions). What I liked most about the film was the audience manipulation, the way it swept the carpet out from under the viewer’s feet at the end. (Hitchcock would have been proud.) The climactic revelation isn’t a twist-in-the-tale put in merely to create frisson (as the ending of The Sixth Sense was): it’s crucial to the film’s thematic concerns. It draws the focus back to Elijah and reveals that the story was really about him all along. Though David has the most screen time, Unbreakable begins and ends with Elijah – the first shot is of his birth, with the doctor realising that many of the infant’s bones are broken; the last shot is a freeze frame of his embittered, vehement face, after he’s said those closing lines. David may or may not be a superhero, and if he is, he’s one with very limited powers; but Elijah, by immersing himself into a fantasy world to deal with loneliness and frustrations, has become a bona fide supervillain. And he’s been two steps ahead of the hero all the way. It’s always so much more easy to do effective evil than to do effective good. In fact, the general pessimism of the ending makes me wonder if Shyamalan was joking when he announced his intention to shoot a sequel to this film (presumably taking the adventures of superhero David further). At a stretch, I can even imagine a Sixth Sense sequel where the Bruce Willis character takes on the Ghostbusters led by an aging Bill Murray. (They could have a contest for the Most Solemn Expression and the winner gets a date with Paul Giamatti.) 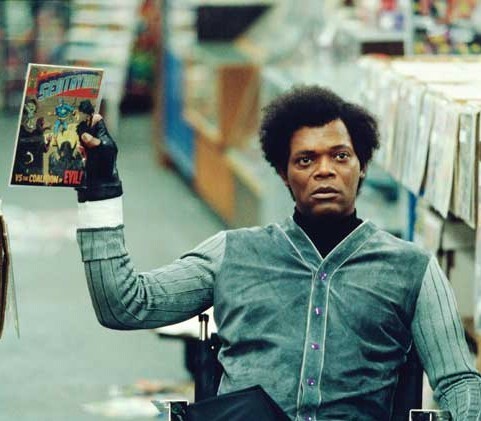 But Unbreakable is a stand-alone; its ending so thoroughly dispels any fantasies of heroism that it’s hard to see where a sequel could possibly go. 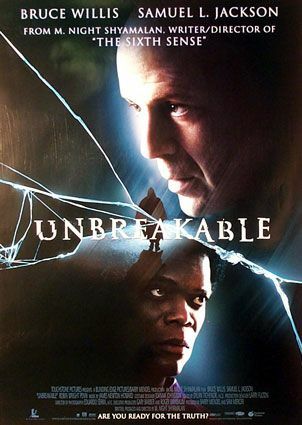 In many ways, Unbreakable is a repetition of an opinion often voiced in comic book universes that the supervillains are in fact a reaction, and hence a result of the existence of the superhero - The Dark Knight Returns mentioned more than once that the Joker was created because there was a Batman. Here, the supervillain needs the superhero or else his life is meaningless. Though his villainy predates the appearance of the superhero, he is a reaction to the superhero - the antithesis. The end, where Willis alerts the cops to him and lets them take him away was brilliant. By not using his superpowers to defeat him, Willis was perhaps dealing him the unkindest cut. I'm so glad u wrote this. I couldn't agree more. Unbreakable is always getting swept under the rug, or generally dismissed. Undeservedly. Lady in the Water sucked mightily. Up until then, I had enjoyed all of his movies to some degree. I totally agree - I loved the movie and the ending truly shocked me. Fail to understand why it is continually overlooked and why it didn't get rave reviews in the first place! No plans on seeing Unbreakable or Lady in the Water any time soon. Not a Shyamalan fan (or a big movie buff). Although digressing to Samuel L Jackson... please tell me we'll get a review of Snakes on a Plane. Yup! The scene where Willis falls into the pool was amazingly shot! There's another one I particularly love: The one where he walks through the subway or tunnel of some sort with the hood and trying to come in terms with his powers as he comes in contact with various people. The background score at that point was particularly good! Unbreakable was one of Shyamalan's better movies. Just been reading through your blog, it's been very interesting. Obviously you're a book lover - do you grace any online forums? I don't really have much to add to your critical assessment. I just wanted to point out an odd series of coincidences. Today when transferring my feeds to a PDA, I noticed Jabberwock, a blog which I had added to my RSS reader long ago without having read it for an entire year. Apparently at one point I found your blog interesting, but never got around to actually reading it. When looking at your recent posts, I was delighted to find interesting stuff. I hope to check in more often! I remember seeing Unbreakable with my family and their neighbors. I don't see movies often with people, but this was some special holiday for us. I was the snob of the group; there were also 3 people over 50 years old, one young mom and 2 teenage girls. They/we all hated it. It just seemed excessive and simple-minded and yes, long. I accepted the ambitiousness of the film, but just couldn't get into the story. Sorry for expressing a reaction more visceral than critical, but to tell the truth I don't remember much about it. Although I didn't love either film, I do enjoy one theme in this writer which I've identified with American Hollywood. It's the Hollywood fairy tale. We tend to have lots of mainstream movies with fairy tale magic, sentimental, childlike, engaging and yes, a little simple-minded. I like them. Most of them are parables of some sort. I would include in this genre: Big, Forest Gump, Groundhog Day, Ghost and ET. My favorite in the genre is Woody Allen's Purple Rose of Cairo (where a character from the screen steps out into the real world at a movie theatre). 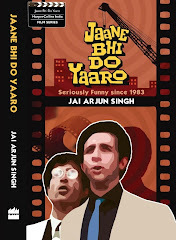 Since Bollywood aims for mass consumption, I suspect they have their equivalents. I couldn't agree more! Unbreakable I think is the most "ok" flick I've seen so far of Shyamalan. My husband saw " the lady in the water" and he regreted of even watching it. " The Village " was no good either. Ani: thanks for the input. There's also a passage in the Hollie Mason book extracts section of Watchmen where costumed superheroes start feeling a bit foolish when the supervillains refuse to play along (by not showing up in costume). That's related to the theme of interdependence too. Lalbadshah: yes, I loved the score too. Robert: thanks. W.r.t. that observation about accepting the ambitiousness of the film but not get into the story, I think that's a problem many viewers have with Shyamalan's films. They see that there's an interesting idea in there somewhere, but the director's treatment of it (especially the downright silly, badly acted scenes that appear in every one of his films) puts them off. For what it's worth though, my reaction to Unbreakable was visceral too. Thank Goodness there are a few people who like "Unbreakable". It took me a while to understand what the movie was saying. But ever since, I've often wondered why nobody discusses this movie along with the others. @Gamesmaster: In this case the irony lay in that he needed to create the superhero to justify his own 'weakness'/ villiany. So who is a reaction to what is not that easy to settle. One of those movies which in second viewing reveals that you have been missing the obvious. Of course there is something creepy going on with Elijah, he is the villain and has been manipulating all along. All the scenes make so much sense in the second viewing. And yes, the story all along was about Elijah.